Frae the tap, left tae richt: Iglesia Matriz de la Concepción, Mercado Nuestra Señora de África, Puente Serrador, Torres de Santa Cruz, Panoramic ceety, Auditorio de Tenerife, Playa de Las Teresitas an Plaza de España. Nickname(s): "La Capital Chicharrera", "La Capital Tinerfeña", "La Capital Santacrucera", "The Sydney o the Atlantic". 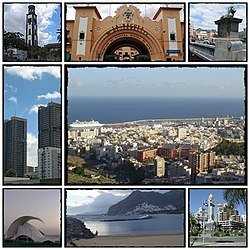 3 Mey 1494, foondit as "Real de la Santa Cruz"
Santa Cruz de Tenerife (commonly kent as Santa Cruz) is the caipital (jointly wi Las Palmas de Gran Canaria), seicont-maist muckle ceety o the Autonomous Community o the Canary Islands an the 21st lairgest ceety in Spain, wi a population o 222,417 in 2009. Santa Cruz is the seicont lairgest ceety an metropolitan aurie o the European Union ootside Europe. Santa Cruz de Tenerife is an aa the caipital o the island o Tenerife (maist populatit o archipelago an Spain) an caipital o the province o Santa Cruz de Tenerife. Locatit in northeast quadrant o Tenerife, aboot 210 kilometres (130 mi) aff the northwastren coast o Africae athin the Atlantic Ocean. Atween the 1833 territorial diveesion o Spain an 1927 Santa Cruz de Tenerife wis the sole caipital o the Canary Islands, till 1927 when a decree ordered that the caipital o the Canary Islands be shared, as it remains at present. The port is o great importance an is the communications hub atween Europe, Africae an Americas, wi cruise ships arrivin frae mony naitions. The ceety is the nerve centre on domestic an inter-island communications in the Canary Islands. Wikimedia Commons haes media relatit tae Santa Cruz de Tenerife. This page wis last eeditit on 10 Mairch 2018, at 20:02.